The fishbone diagram identifies many possible causes for an effect or problem. It can be used to structure a brainstorming session. It immediately sorts ideas into useful categories and it´s very powerful tool used together with other Problem Solving tools - 5why´s, 5W2H ect. 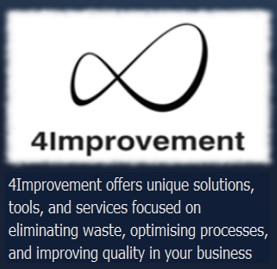 ECRS is unique approach towards process activity optimization, and if we keep the 7 types of waste in mind and use the ECRS tool in combination with other efforts such as SMED (single minute exchange of dies), 5W1H, 5WHY´s or 5S it will be powerful indeed. The 5 Whys technique is true to this tradition, and it is most effective when the answers come from people who have hands-on experience of the process being examined. It is remarkably simple: when a problem occurs, you drill down to its root cause by asking "why?" five times. 8D stands for the 8 disciplines or the 8 critical steps for solving problems. It is a highly disciplined and effective scientific approach for resolving chronic and recurring problems. This approach uses team synergy and provides excellent guidelines to identify the root cause of the problem. IS - IS NOT analysis works by making you deliberately think about the problem and in particular the boundaries of what it is or is not. It thus helps to create focus in attention and consequently is more likely to lead to the right problem being solved - it is a very common issue that..
A method that uses a continuous line to trace the path and distance traveled of a particular object or person throughout a process. It is most commonly illustrated on a floor map diagram that contains the entire process you are evaluating; i.e. a manufacturing floor, hospital floor, office layout, etc. The 5W2H method is one of the most efficient management tools that exists and, oddly enough, one of the most simple and easy to apply. The 5W2H approach is nothing more than a qualified, structured and practical plan of action, with well-defined stages. PDCA, sometimes called the "Deming Wheel," "Deming Cycle," or PDSA was developed by renowned management consultant Dr William Edwards Deming in the 1950s. Deming himself called it the "Shewhart Cycle," as his model was based on an idea from his mentor, Walter Shewhart. A3 is simply a problem-solving method similar to PDCA (Plan-Do-Check-Act) and DMAIC (Define-Measure-Analyse-Improve-Control). However, it’s actually derived from PDCA and was developed by Toyota. You’ll see as I take you through A3 how it follows the steps of PDCA. 5S is a methodology for organisation, standardization and cleanliness. At the heart of 5S is the lean goal of reducing waste. 5S addresses the wastes generated through disorganisation and provides a way of eliminating that disorganisation. Lean principles are as applicable in a service industry or your administrative offices as they are in Manufacturing, in fact in some cases even more important, and the same 5 steps of 5S that you applied in your manufacturing areas as in your administrative processes. Supply strategies in a lean environment should support the operations strategy. It is appropriate then to use lean concepts and lean terminology in the creation of supply strategy for lean operations. For this reason, 5S is an appealing model for supply strategy. Audits ultimately confirm the effectiveness of 5S in your workplace. Regularly conducting a 5S audit has obvious benefits, such as, creating a continuous improvement cycle, which keeps items organized and eliminates waste. When you begin to work at a place, you usually start at the bottom. You have to make your way to the top without any help and you need a mechanism to make that encounter. This 5S system consists of ideas and tips which will help you climb the ladder.